The Lockheed C-141 Starlifter was a military strategic airlifter that served with the Military Air Transport Service (MATS), its successor organization the Military Airlift Command (MAC), and finally the Air Mobility Command (AMC) of the United States Air Force (USAF). The aircraft also served with airlift and air mobility wings of the Air Force Reserve (AFRES), later renamed Air Force Reserve Command (AFRC), the Air National Guard (ANG) and, later, one air mobility wing of the Air Education and Training Command (AETC) dedicated to C-141, C-5, C-17 and KC-135 training. Introduced to replace slower propeller driven cargo planes such as the C-124 Globemaster II and C-133 Cargomaster, the C-141 was designed to requirements set in 1960 and first flew in 1963. Production deliveries of an eventual 285 planes began in 1965: 284 for the Air Force, and one for the National Aeronautics and Space Administration (NASA) for use as an airborne observatory. The aircraft remained in service for over 40 years until the USAF withdrew the last C-141s from service in 2006, after replacing the airlifter with the C-17 Globemaster III. In the early 1960s, the United States Air Force's Military Air Transport Service (MATS) relied on a substantial number of propeller-driven aircraft for strategic airlift. As these aircraft were mostly obsolescent designs and the Air Force needed the benefits of jet power, the USAF ordered 48 Boeing C-135 Stratolifters as an interim step. The C-135 was a useful stop-gap, but only had side-loading doors and much of the bulky and oversize equipment employed by the U.S. Army would not fit. In the spring of 1960 the Air Force released Specific Operational Requirement 182, calling for a new aircraft that would be capable of performing both strategic and tactical airlift missions. The strategic role demanded that the aircraft be capable of missions with a radius of at least 3,500 nautical miles (6,500 km) with a 60,000 pounds (27,000 kg) load. The tactical role required it to be able to perform low-altitude air drops of supplies, as well as carry and drop combat paratroops. Several companies responded to SOR 182, including Boeing, Lockheed, and General Dynamics. Early C-141As of 436th Airlift Wing, MAC, at Brisbane Airport, Australia supporting the visit of President Lyndon B. Johnson, 22 October 1966. Lockheed responded to the requirement with a unique design: the Lockheed Model 300, the first large jet designed from the start to carry freight. The Model 300 had a swept high-mounted wing with four 21,000 pounds-force (93 kN) thrust TF33 turbofan engines pod-mounted below the wings. An important aspect was the cabin's floor height of only 50 inches (130 cm) above the ground, allowing easy access to the cabin through the rear doors. The two rear side doors were designed to allow the aircraft to drop paratroops (in August 1965 the aircraft performed the first paratroop drop from a jet-powered aircraft). The rear cargo doors could be opened in flight for airborne cargo drops. The high-mounted wings gave internal clearance in the cargo compartment of 10 feet (3.0 m) wide, 9 ft (2.7 m) high and 70 ft (21 m) long. The size enabled the Starlifter to carry, for example, a complete LGM-30 Minuteman intercontinental ballistic missile in its container. The aircraft was capable of carrying a maximum of 70,847 pounds (32,136 kg) over short distances, and up to 92,000 pounds (42,000 kg) in the version configured to carry the Minuteman, which lacked other equipment. The aircraft could also carry up to 154 troops, 123 paratroops or 80 litter patients. The Apollo 11 Mobile Quarantine Facility is unloaded from a C-141 at Ellington Air Force Base, July 27, 1969. President John F. Kennedy's first official act after his inauguration was to order the development of the Lockheed 300 on 13 March 1961, with a contract for five aircraft for test and evaluation to be designated the C-141. One unusual aspect of the aircraft was that it was designed to meet both military and civil airworthiness standards. The prototype C-141A serial number 61-2775 was manufactured and assembled in record time. The prototype was rolled out of the Lockheed factory at Marietta, Georgia on 22 August 1963 and first flew on 17 December, the 60th anniversary of the Wright brothers' first flight. The company and the Air Force then started an operational testing program and the delivery of 284 aircraft. An effort to sell the aircraft on the civilian market resulted in provisional orders from Flying Tiger Line and Slick Airways for four aircraft each. These were to be a stretched version, 37 feet (11 m) longer than the C-141A, and marketed as the L-300 SuperstarLifter. Other changes were also incorporated to make it more commercial, including a different yoke. The development was not sustained and only one civilian demonstration aircraft was built. When no commercial sales were made Lockheed donated the aircraft to NASA. The prototype and development aircraft then began an intensive operational testing program including the first delivery to MATS (63-8078) on 19 October 1964 to the 1707th Air Transport Wing, Heavy (Training), Tinker Air Force Base, Oklahoma. Testing continued and a Federal Aviation Authority type certificate was awarded on 29 January 1965. The first delivery to an operational unit (63-8088) was made on 23 April 1965 to the 44th Air Transport Squadron, 1501st Air Transport Wing, Travis Air Force Base, California. Although operational testing continued, due to the United States' military involvement in South Vietnam, the C-141 was soon employed in operational sorties to the combat zone. On 8 January 1966, following the disestablishment of MATS, all C-141s were transferred to the newly established Military Airlift Command (MAC). In October 1973, C-141s and C-5s airlifted supplies from the United States to Israel during the 1973 Yom Kippur War as part of Operation Nickel Grass. Over the course of the operation, C-141s flew 422 missions and carried a total of 10,754 tons of cargo. The first strategic airlift flight of Operation Desert Shield was flown by a MAC C-141 of the 437th Military Airlift Wing out of Charleston AFB, SC, on 7 August 1990. The C-141 proved to be a workhorse airlifter of Operations Desert Shield and Desert Storm, flying 159,462 short tons (144,661,000 kg) of cargo and 93,126 passengers during 8,536 airlift missions. On 1 June 1992, following the disestablishment of Military Airlift Command, all C-141s and the airlift wings to which they were assigned were transferred to the newly established Air Mobility Command (AMC). Air Force Reserve Command (AFRC) and Air National Guard (ANG) C-141s and units were also transferred to AMC. Hanoi Taxi flying over the National Museum of the United States Air Force in December 2005. In 1994 one of the aircraft at Wright-Patterson AFB was identified by its crew chief as the Hanoi Taxi (AF Serial Number 66-0177), the first aircraft to land in North Vietnam in 1973 for Operation Homecoming in the final days of the Vietnam War, to repatriate American POWs from North Vietnam. Between 1996 and 1998 a C-141A was used as a towing aircraft in the Eclipse project (NASA) to demonstrate the possibility of using aerotow systems to bring towed winged vehicles to sufficient altitude to launch small satellites, the ultimate goal was to lower the cost of space launches. Six successful tests were flown with a modified Convair F-106 Delta Dart, the QF-106 variant, in tow, piloted by Mark Stucky. A similar system can be seen in SpaceShipTwo, whereby atmospheric engines carry a rocket-engined "second stage" to high altitude for launch. On 16 September 2004, the C-141 left service with all active duty USAF units, being confined to Air Force Reserve and Air National Guard units for the remainder of its operational service life. As of 25 September 2005, there were only eight C-141 aircraft still flying, all from the Air Force Reserve's 445th Airlift Wing (445 AW) at Wright-Patterson AFB. In 2004, 2005, and 2006, the C-141s assigned to the 445 AW participated in missions to Iraq and Afghanistan, mostly for the medical evacuation of wounded service members. The last eight C-141s were officially retired in 2006. In 2005, Hanoi Taxi and other aircraft were marshalled by the Air Force to provide evacuation for those seeking refuge from Hurricane Katrina. This aircraft and others evacuated thousands of people, including the medical evacuation (MEDEVAC) of hundreds of ill and injured. With the 5 May 2005 announcement of the retirement of these last eight C-141s, the Hanoi Taxi embarked on a series of flights, giving veterans, some of whom flew out of POW captivity in Vietnam in this aircraft, the opportunity to experience one more flight before retirement. On 6 May 2006, the Hanoi Taxi landed for the last time and was received in a formal retirement ceremony at the National Museum of the United States Air Force, located at Wright-Patterson Air Force Base near Dayton. 15 aircraft including the "Hanoi Taxi" are now on static display at various air museums around the United States, all the remaining airframes retired to the "boneyard" at Davis-Monthan AFB, Arizona have been scrapped. The original Starlifter model, designated C-141A, could carry 154 passengers, 123 paratroopers or 80 litters for wounded with seating for 16. A total of 284 A-models were built. The C-141A entered service in April 1965. It was soon discovered that the aircraft's volume capacity was relatively low in comparison to its lifting capacity; it generally ran out of physical space before it hit its weight limit. The C-141A could carry ten standard 463L master pallets and had a total cargo capacity of 62,700 pounds (28,400 kg). It could also carry specialized cargoes, such as the Minuteman missile. NASA obtained Lockheed's C-141 demonstrator, designated L-300. The airplane was modified to house the Kuiper Airborne Observatory (KAO) telescope for use at very high altitudes. This aircraft, NC-141A is in storage at NASA Ames Research Center, Moffett Federal Airfield, California. The KAO was retired in 1995 and was replaced by the 747SP-based Stratospheric Observatory for Infrared Astronomy (SOFIA). In service, the C-141 proved to "bulk out" before it "grossed out", meaning that it often had additional lift capacity that went wasted because the cargo hold was full before the plane's weight capacity had been reached. To correct the perceived deficiencies of the original model and utilize the C-141 to the fullest of its capabilities, 270 in-service C-141As (most of the fleet) were stretched, adding needed payload volume. The conversion program took place between 1977 and 1982, with first delivery taking place in December 1979. These modified aircraft were designated C-141B. It was estimated that this stretching program was equivalent to buying 90 new aircraft, in terms of increased capacity. Also added was a boom receptacle for inflight refueling. The fuselage was stretched by adding "plug" sections forward and aft of the wings, lengthening the fuselage a total of 23 feet 4 inches (7.11 m) and allowing the carriage of 103 litters for wounded, 13 standard pallets, 205 troops, 168 paratroopers, or an equivalent increase in other loads. In 1994, a total of 13 C-141Bs were given SOLL II (Special Operations Low-Level II) modifications, which gave the aircraft a low-level night flying capability, enhanced navigation equipment, and improved defensive countermeasures. These aircraft were operated by AMC in conjunction with Air Force Special Operations Command (AFSOC). NASA – 1 C-141A Construction Number 300-6110. Did not receive a USAF serial number, was flown with civil registration N4141A and later as NASA N714NA. Operated 1966–1995. 19 C-141s were destroyed in accidents through 2005. 23 March 1967 (1967-03-23): the worst ground aviation accident of the Vietnam War occurred at Da Nang Air Base, South Vietnam when a traffic controller cleared USMC A-6A Intruder, BuNo 152608, of VMA(AW)-242, MAG-11, for takeoff but also cleared USAF C-141A-LM Starlifter, AF serial number 65-9407, of the 62nd Military Airlift Wing, McChord AFB, Washington, to cross the runway. The A-6's crew saw the Starlifter at the last moment and veered off of the runway to try to avoid the collision, but despite this, the A-6's port wing sliced through the C-141's nose, which immediately caught fire. The C-141's load of 72 acetylene gas cylinders ignited and caused a tremendous explosion. Only the loadmaster survived, escaping through the rear hatch. The A-6 overturned and skidded down the runway on its back, but both its crewmembers, Capt. Frederick Cone and Capt. Doug Wilson, survived, crawling out of the smashed canopy after the jet came to a halt. Some of the A-6's ordnance load of bombs and rocket packs went off in the ensuing fire. The Military Airlift Command crew killed were Capt. Harold Leland Hale, Capt. Leroy Edward Leonard, Capt. Max Paul Starkel, SSgt. Alanson Garland Bynum, and SSgt. Alfred Funck. This was the first of two C-141s lost during the conflict, and one of only three strategic airlifters written off during the Vietnam War. 12 April 1967 (1967-04-12): C-141A, AF Ser. No. 66-0127 crashed after taking off from Cam Rahn Bay AB, Vietnam. Five crew were killed and 2 were rescued. 28 August 1973 (1973-08-28): C-141A 63-8077 crashed in mountains near Torrejon AB, Spain; 24 of the 25 crew and passengers on board were killed. 18 August 1974 (1974-08-18): C-141A 65-0274, of the 437th MAW, Charleston AFB, South Carolina, hit Mount Potosi at the 19,000 feet (5,800 m) altitude, about 17 miles (27 km) from destination, John F. Kennedy International Airport, La Paz, Bolivia, killing seven crew. 21 March 1975 (1975-03-21): an air traffic controller confused aircraft call signs and cleared a McChord AFB based C-141A-20-LM, 64-0641, of the 62d Military Airlift Wing, to descend below safe minimums and it impacted Mount Constance in the Olympic National Forest, Washington, killing 16 passengers and crew. 28 August 1976 (1976-08-28): C-141A 67-0008 stalled and crashed after an aborted landing at Sondestrom AB, Greenland killing 23 of the 27 crew and passengers; that same day another C-141, 67-0006, broke up in a severe thunderstorm while on descent into RAF Mildenhall, UK killing 18 passengers and crew. 12 November 1980 (1980-11-12): C-141 67-0030 crashed while landing at Cairo, Egypt. It hit short of the runway while attempting to land at night in the desert with no ground lights as a visual reference, all 13 aboard were killed. 31 August 1982 (1982-08-31): C-141B 64-0652 crashed in the mountains of Tennessee (Cherokee National Forest) during a SOLL-I training mission. The local SOLL I training mission departed Charleston shortly before 1300 hours. The crew was extremely experienced. Weather along the route was reported by other aircraft as 4500 feet overcast, tops to 8000 feet, with zero visibility below 4500 feet due to rain showers, ragged ceiling, multi-layered stratus and fog. Route weather was below MAC minimums. Radar plots by Atlanta Center tracked the aircraft on the route. At 1427, the plots showed the aircraft in a progressive climb from 2500 feet. The aircraft impacted 4908 foot John's Knob in the Tellico Wildlife Area, 118 feet short of the peak. At the time of impact the aircraft was in a slight climb of 4-5 degrees (approximately 2000 feet per minute). There were no survivors among the crew of nine. Speculation was that the crew was attempting to use the recently installed Bendix color radar in the MAP mode, for terrain avoidance. The flight recorder and cockpit voice recorder were unrecoverable. 12 July 1984 (1984-07-12): C-141B 64-0624 experienced an uncontained failure of its number 3 engine immediately after takeoff from NAS Sigonella, on the Italian island of Sicily. Ejected debris caused number 4 engine to also fail. Debris also entered the cargo compartment and started a fire in a pallet containing paint. The cargo fire produced thick poisonous smoke which made visual control of aircraft extremely difficult. The aircraft entered a steep bank and crashed just over three minutes after takeoff. All 8 crew men and a passenger on board were killed. Post crash toxicology indicated the crew had received potentially fatal levels of cyanide poisoning from the smoke, prior to impact. Subsequent to this accident, smoke goggles were added to crew oxygen masks. 20 February 1989 (1989-02-20): C-141B 66-0150 crashed while attempting to land at Hurlburt Field, Florida. The aircraft was executing a non-precision approach to the air base's Runway 18 during heavy thunderstorm activity with low visibility. The aircraft descended below minimum descent altitude and crashed in a wooded area north of Hurlburt Field. All 7 crew members and 1 passenger were killed. 1 December 1992 (1992-12-01): two McChord-based C-141Bs, serial numbers 65-0255 and 66-0142 flying a nighttime air refueling mission collided over Montana and crashed. All 13 crew members died. 13 September 1997 (1997-09-13): a German Air Force Tu-154M collided with a USAF C-141B (65-9405) while cruising off the Namibian coast. All 24 crew and passengers on the Tu-154 plus the 9 crew on the C-141 were killed. Neither aircraft was equipped with TCAS collision avoidance system, and the Tupolev was flying at the wrong semicircular cruising altitude, while not being in contact with the Namibian air traffic control. 61-2775 "First of the Fleet" – C-141A is on display at the Air Mobility Command Museum at Dover Air Force Base near Dover, Delaware. This airframe is the first C-141 built. 61-2779 "Against the Wind" – NC-141A is in storage with the Air Force Flight Test Museum at Edwards Air Force Base near Rosamond, California. It was used as an Advanced Radar and Electronic Counter Countermeasures Test Bed. 63-8079 "City of Charleston" – C-141B is on display at the Charleston AFB Air Park at Charleston Air Force Base in Charleston, South Carolina. 63-8088 "The Golden Bear" – C-141B is on display at the Travis Air Force Base Heritage Center at Travis Air Force Base near Fairfield, California. It was the first C-141 delivered to Travis AFB. 64-0626 – C-141B is on display at the Air Mobility Command Museum at Dover Air Force Base near Dover, Delaware. 65-0236 – C-141B is on display at the Scott Field Heritage Air Park at Scott Air Force Base near Belleville, Illinois. This airframe participated in Operation Homecoming returning POWs from Hanoi. 65-0248 – C-141C is on display at the Museum of Aviation at Robins Air Force Base near Warner Robins, Georgia. This replaced another airframe that was previously on display at the museum. 65-0257 "Spirit of the Inland Empire" – C-141B is on display at the March Field Air Museum at March Air Reserve Base in Riverside, California. MSN 6110 – L-300 is in storage at the Ames Research Center at Moffett Federal Airfield in Mountain View, California. It was used by NASA (NASA-714) as the Kuiper Airborne Observatory. This airframe was the only Starlifter built as a civilian version. 65-0277 "Tacoma Starlifter" – C-141B is on display at the McChord Air Museum at McChord Air Force Base in Lakewood, Washington. 65-9400 – C-141B is on display at Altus Air Force Base near Altus, Oklahoma. 66-0177 "Hanoi Taxi" – C-141C is on display at the National Museum of the United States Air Force at Wright-Patterson Air Force Base in Dayton, Ohio. 66-0186 – C-141B is on display at the Aviation Wing of the Marietta Museum of History adjacent to Dobbins Joint Air Reserve Base in Marietta, Georgia. This is the first Starlifter to be converted from "A" model to "B" model. 66-7947 "Garden State Airlifter" – C-141B is on display at Starlifter Memorial Park at McGuire Air Force Base, New Jersey. 67-0013 – C-141B is on display at the Pima Air and Space Museum adjacent to Davis-Monthan Air Force Base in Tucson, Arizona. A MAC C-141 transports the remains of the crew from Space Shuttle Challenger's doomed last mission to Dover AFB, Delaware. ^ "Operation Nickel Grass. "Air Mobility Command Museum. Retrieved: 23 August 2014. ^ Matthews and Holt 1992, pp. 37–40. ^ "NASA - NASA Dryden Technology Facts - Aerotow". nasa.gov. Retrieved 2018-10-14. ^ "LOCKHEED C-141C STARLIFTER 'HANOI TAXI'. "National Museum of the United States Air Force. Retrieved: 28 November 2012. ^ Donald, David, ed. "Lockheed C-141 StarLifter". The Complete Encyclopedia of World Aircraft. Barnes & Nobel Books, 1997. ISBN 0-7607-0592-5. ^ "SOFIA Airborne Observatory Completes First Test Flight". USRA. 2007-04-26. Archived from the original on 2008-05-12. ^ Eden, Paul, ed. "Lockheed C-141 Starlifter". Encyclopedia of Modern Military Aircraft. Amber Books, 2004. ISBN 1-904687-84-9. ^ a b c d Johnsen 2005, p. 98. ^ Hobson, Chris, Vietnam Air Losses. Hinkley UK: Midland Press, 2001, p. 93. ^ C-141A crash on 28 August 1973. Aviation-safety.net. Retrieved 14 March 2016. ^ Gainesville, Georgia: WFOX-FM radio, Monday, 19 August 1974. ^ Columbia, South Carolina: The State, Thursday, 22 August 1974, page 2B. ^ Columbia, South Carolina: The State, Tuesday, 27 August 1974, p. 10A. ^ Greenville, South Carolina: Greenville News, Tuesday, 27 August 1974, p. 3. ^ United Press International, "All 16 Aboard AF Jet Dead", Playground Daily News, Fort Walton Beach, Florida, Sunday 23 March 1975, Volume 30, Number 38, page 1A. ^ United Press International, "Air Traffic Controller Error Caused Crash", Playground Daily News, Fort Walton Beach, Florida, Wednesday 26 March 1975, Volume 30, Number 41, p. 5A. ^ "Spokane Daily Chronicle". Google. Retrieved 16 May 2011. ^ "USAF Mishap Report"C141 Heaven. Retrieved: 13 October 2014. ^ "Accident Description" Aviation Safety Network. Retrieved: 13 October 2014. ^ Mcchord Cargo Jets Collide -- 13 Killed In Crash Over Montana. The Seattle Times, December 1, 1992. ^ "C-141A Starlifter". Air Mobility Command Museum. AMC Museum Foundation, Inc. Retrieved 4 October 2016. ^ Novack, Mike. "C-141 Tail Number:". C141Heaven. Retrieved 5 October 2016. ^ "Joint Base Charleston Air Park". Joint Base Charleston. February 13, 2013. Retrieved 4 October 2016. ^ Novack, Mike. "C-141 Tail Number: 63-8079". C141 Heaven. Retrieved 5 October 2016. ^ Veronico, Nick. "Outdoor Exhibits - C-141B "Starlifter"". Travis Air Force Base Heritage Center. Travis Heritage Center. Retrieved 4 October 2016. ^ "C-141B Starlifter". Air Mobility Command Museum. AMC Museum Foundation, Inc. Retrieved 4 October 2016. ^ "C-141 STARLIFTER". Scott Field Heritage Air Park. Scott Field Heritage Air Park. Retrieved 4 October 2016. ^ "Airframe Dossier - Lockheed C-141B Starlifter, s/n 65-0236 USAF, c/n 300-6087". Aerial Visuals. AerialVisuals.ca. Retrieved 5 October 2016. ^ "C-141C "Starlifter"". Museum of Aviation. Retrieved 4 October 2016. ^ Novack, Mike. "C-141 Tail Number: 65-0248". C141Heaven. Retrieved 5 October 2016. ^ "C-141B Starlifter". March Field Air Museum. March Field Air Museum. Retrieved 4 October 2016. ^ Novack, Mike. "C-141 Tail Number: 65-0257". C141Heaven. Retrieved 5 October 2016. ^ "Airframe Dossier - Lockheed L-300-50A-01, c/n 300-6110, c/r N714NA". Aerial Visuals. AerialVisuals.ca. Retrieved 5 October 2016. ^ Novack, Mike. "C141Heaven: NASA C-141Information". C141Heaven. Retrieved 5 October 2016. ^ "LOCKHEED C-141B STARLIFTER". McChord Air Museum. The McChord Air Museum Foundation. Retrieved 4 October 2016. ^ Novack, Mike. "C-141 Tail Number: 65-9400". C141Heaven. Retrieved 5 October 2016. ^ "Lockheed C-141C Starlifter "Hanoi Taxi"". National Museum of the US Air Force. 7 June 2016. Retrieved 5 October 2016. ^ "Airframe Dossier - Lockheed YC-141B Starlifter, s/n 66-0186 USAF, c/n 300-6212". Aerial Visuals. AerialVisuals.ca. Retrieved 5 October 2016. ^ M., Stan (22 March 2013). 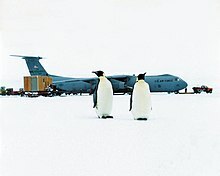 "Photo: "66-0186 was first C-141 to be stretched to a B Model"". TripAdvisor. TripAdvisor LLC. Retrieved 5 October 2016. ^ "C141 Memorial". Thomas B. McGuire Memorial Foundation. Retrieved 4 October 2016. ^ "C-141 ground breaking". Joint Base McGuire-Dix-Lakehurst. 21 March 2008. Retrieved 4 October 2016. ^ Lee, Darrick; Boyd, Gary (12 November 2008). "Starlifter memorial honors aircraft, the Airmen it served". Joint Base McGuire-Dix-Lakehurst. Retrieved 5 October 2016. ^ Mike, Novack. "C-141 Tail Number:". C141Heaven. Retrieved 5 October 2016. ^ "STARLIFTER". Pima Air & Space Museum. PimaAir.org. Retrieved 4 October 2016. Ogden, Bob. Aviation Museums and Collections of North America (2 ed.). Tonbridge, Kent: Air Britain (Historians) Ltd, 2011. ISBN 978-0-85130-427-4. Wikimedia Commons has media related to C-141 Starlifter. This page was last edited on 7 February 2019, at 22:02 (UTC).